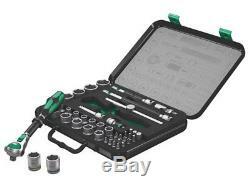 Wera Zyklop Ratchet Wrench Socket Bit Set Combination 3/8 Drive Matric Suitcase. Combiens five different of ratchet in one. Flywheel design and easy-to-grip free-turning sleeve for very high working speeds. 43-piece set in a robust metal case. "Take it easy" Tool Finder with colour coding according to sizes. 43-piece Zyklop set in robust metal case: Zyklop ratchet with 3/8drive. The 72 fine-pitched teeth enable a low return angle of only 5°. The ratchet head pivots freely and can be locked into any position by using the slide switch that is positioned on either side. It is even possible to work conveniently in very confined and difficult-to-access areas with enhanced hand clearance. The predefined locking positions at 0°, 15° und 90°, both to the right and left, ensure safe working without any slipping of the ratchet head. The ratchet can be used as a conventional screwdriver in the 0° position by attaching an adaptor and a bit. The flywheel design ensures rapid screwdriving. The rotation-symmetric construction of the Kraftform handle and the free-turning sleeve support rapid twisting. The outstanding design of the Kraftform handle fits perfectly into the hand preventing hand injuries such as blisters and calluses. The hard materials used for the handle ensure quick and easy hand repositioning without any danger of the skin "sticking" to the handle. The softer anti-slip zones enable the low-loss transfer of high torque. For 3/8" square sockets as well as 3/8" adaptors with square drive, equipped with ball lock. Including 18 Zyklop sockets, 2 Zyklop extensions with free-turning sleeve, 1 T-handle, 1 wobble extension, 1 universal joint, 1 adaptor with quick-release chuck, 18 bits. "Take it easy" Tool Finder with colour coding according to sizes. 1 x 8000 B Zyklop Ratchet 3/8 in Drive. 1 x 8794BZyklop Wobble Extension. 1 x 8795 B Zyklop Universal Joint. 1 x 8796 LB Zyklop Flexible Lock Extension 200mm. 1 x 8796 SB Zyklop Flexible Lock Extension 125mm. 1 x 8784 B1 Zyklop Adaptor. 1 x 8789 B Zyklop Sliding T-Handle. 1 x 800/1 Z Slotted Bits 25mm: 1.0 x 5.5mm. 6 x 840/1 Z Hex-Plus Bits 25mm: 3.0, 4.0, 5.0, 6.0, 8.0, 10mm. 2 x 851/1 Z 25mm Phillips Bits 25mm: PH2, PH3. 2 x 855/1 Z 25mm Pozi Bits 25mm: PZ2, PZ3. 7 x 867/1 Z TORX Bits 25mm: TX10, TX15, TX 20, TX25, TX27, TX30, TX40. 18 x 8790 HMB Zyklop Sockets: 6.0, 7.0, 8.0, 9.0, 10.0, 11.0, 12.0, 13.0, 14.0, 15.0, 16.0, 17.0, 18.0, 19.0, 20.0, 21.0, 22.0, 24mm. We will do our best to provide a solution. We stand behind every product we sell. Feedback is extremely important to us! 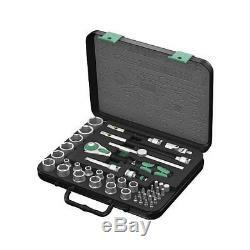 The item "Wera Zyklop Ratchet Wrench Socket Bit Set Combination 3/8 Drive Matric Suitcase" is in sale since Monday, July 23, 2018. This item is in the category "Home & Garden\Tools & Workshop Equipment\Hand Tools\Wrenches\Socket Wrenches".